JULY 16—Ravi Sukhu won his second successive race in the Ceres Juices 10K Series on Saturday, taking the race that started and ended at Long Bay Beach, Beef Island, in 41 minutes and 34 seconds. Katrina Crumpler—third overall—won the women’s division in 43:34. 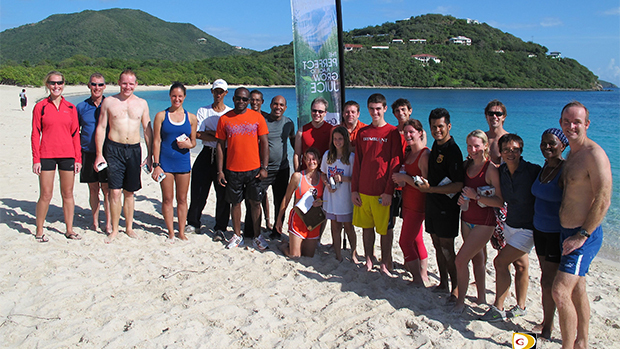 The course took runners from Long Bay Beach, past the airport and over to the entrance of Minine’s Plants, before returning to Tortola, with a trek to Rite Way in East End. Runners finished the course running on the sand at the water’s edge. Final Results; Men: 1. Ravindra Sukhu, 41 minutes and 34 seconds. 2. Reuben Stoby, 43:19. 3. James Carr, 45:19. 4. Joe McIvor, 45:34. 5. Adrian Dale, 45:44. 6. Ezron Simmons, 46:14. 7. Antony Spencer, 47:45. 8. Jude Kinkead, 48:51. 9. Adam Holdt, 49:16. 10. Russell Crumpler, 50:33. 11. Andrew Willins, 51:02. 12. Chris Conway, 53:26. 13. Jonathan McCarthy, 54:48. 14. Shane Donavon, 56:19. 15. Peter Reicheinstein, 57:56. 16. Howard Moore, 1:00.47. 17. David Kinkead, 1:02.18. 18. Stephen Beard, 1:06.18. 19. Dennis Johnson, 1:13.39. 20. Michael Worrell, 1:16:34. Women: 1. Katrina Crumpler, 43:34. 2. Sarah Hayes, 47:55. 3. NiMade Oniasih, 49:47. 4. Gillian Howe, 50:13. 5. Kay Reddy, 51:12. 6. Kim Takeuchi, 51:27. 7. Rosmund Johnson, 55:37. 8. Viviana Toro, 56:47. 9. Jenny McIvor, 56:57. 10. Casey McNutt, 58:52. 11. Anna Kinkead, 59:28. 12. Tallulah Kinkead, 1:02.17. 13. Brenda Pickering, 1:05:42. 14. Candy Wilks, 1:05:45. 15. Shirley Liburd, 1:11:14. 16. Maria Patterson, 1:17:53. Race Walkers: 1.= Linda Li and Jenny McLeary, 1:36:05.